Released in 1975. Music: Buddy Baker. Lyrics: Tom and Frances Adair. Running Time: 31 minutes. Voices: Bill Lee (Narrator/Ebenezer Scrooge); Peter Renaday (Jacob Marley, Ghost of Christmas Past); Jimmy Macdonald (Ghost of Christmas Present). 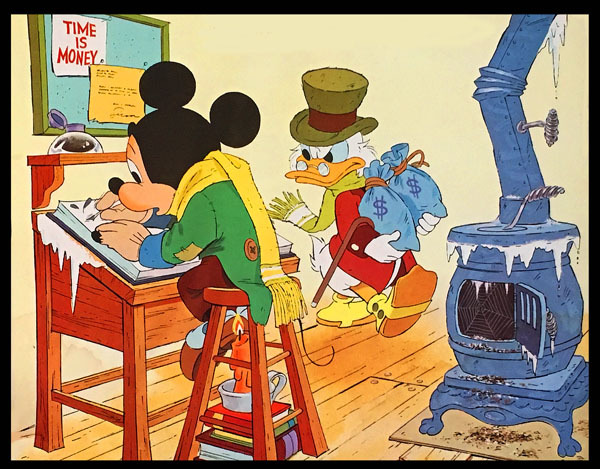 It is well known among Disney and animation enthusiasts that the 1982 Oscar-nominated Mickey’s Christmas Carol was based on a 1975 record album in which various Disney characters played the famous roles. 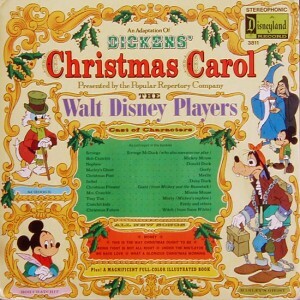 That album, entitled Dickens’ Christmas Carol Featuring The Walt Disney Players, was co-written by oh-c’mon-when-is-he-gonna-be-a-Disney-Legend Alan Young (Mister Ed, The Time Machine), who assumed the Scrooge McDuck role until his passing last year. 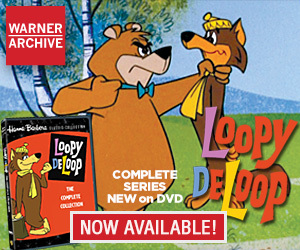 The 1975 Alan Young version–and the 1982 soundtrack hybrid—were both explored in one of my earlier “Animation Spins”. This time, we look at the very strange “lost” version of the 1975 album that existed before the Young version. Produced during the transition period from one set of Disneyland Records management personnel to another, it contained the songs by Tom and Frances Adair, the same arrangements by Buddy Baker, and the same choral work. Most of the songs, however, were longer, either by additional verses or musical bridges and the overall fidelity of the music was stronger than its subsequent versions. The cover and enclosed book are completely identical. That is where the similarity ends. The original album takes a different script approach. For the most part, it takes a more serious tone, though there are amusing comedic lines here and there. Instead of acknowledging that the Disney characters are playing the roles, the story takes a coy approach. Bill Lee narrates as Dickens’ Scrooge, not as Scrooge McDuck, however the appearance of Merlin as a Wizard (playing the Ghost of Christmas Past) is described as such even though Dickens’ Ghost looked very different. We talked about Bill Lee in a previous Spin. A leading Hollywood “ghost singer,” his most famous off-screen singing was for Christopher Plummer in The Sound of Music. Although he recorded dozens of Disney records and was a member of the Mellomen quartet (Lady and the Tramp, Trick or Treat, Alice in Wonderland), this is his only Storyteller narration. If you are familiar with either the 1975 or 1982 albums, here is a scene that fades in from “Being Tight is Not All Right” and out with “Under the Mistletoe,” so you can hear a sample of the difference between the two versions. Released in September, 1973. Writer/Producer: Jimmy Johnson. Narration and Dialogue Director: Peter Renaday (listed as “Pete Renoudet”). Effect Recorders: Jimmy Macdonald, Jimmy Johnson, John Wood. Effect Compilations: Lee Carmichael, Jack Wood. Engineers: Paul Elmore, Frank Kejmar. Running Time: 45 minutes. Voices: Pete Renoudet (Narrator/Father, Santa Claus); Florence Daniel (Mother); Dana Laurita (Jenny); Richie Sanders (Johnny). Songs: “The Sounds of Christmas” by P.L. Renoudet; “Here He Comes” by Francis R. Brunner, Barbara J. Brunner; “We Wish You a Merry Christmas” (Traditional, from the album 30 Favorite Songs of Christmas); “Home Sweet Home” (Traditional, from Lady and the Tramp). Peter Renaday, who made frequent appearances in Disney films at the time (remember Herbie’s suicide scene? ), recorded this unusual album two years before the Dickens’ Christmas Carol LP. A follow-up to the best-selling Chilling, Thrilling Sounds of the Haunted House, side one features a father taking listeners through his family’s Christmas. 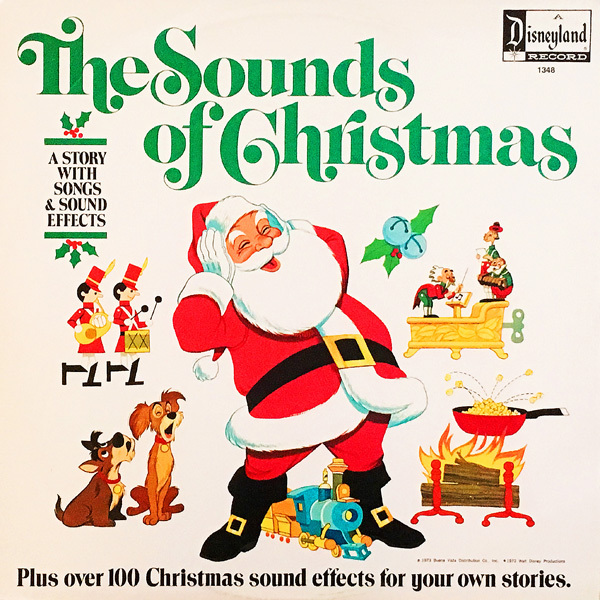 Sound effects, either created for the album or selected from the vast Walt Disney Studios library, punctuated the entire story. The effects were created with the participation of Disney Legend Jimmy Macdonald, who also worked on the Chilling, Thrilling LP. The mother is played by Florence Daniel, a Walt Disney Music Company staff member since 1958. The two children are Richie Sanders and Dana Laurita, who voiced Toby Tortoise and Sister Rabbit in Disney’s 1973 animated version of Robin Hood (see this Spin). Renaday also directed the two for a Robin Hood Story and Songs album the same year, so this is likely to have been part of the same recording session. Among the best things about the album are the songs. Renaday, who sings both with mellow aplomb, wrote the title tune. The other song, “Here He Comes,” is a pre-WWII tune written by Francis and Barbara Brunner, parents of the album’s musical director, Bob Brunner. Brunner performed the song in his childhood with his siblings for GI’s in USO shows. This album marks one of the surprisingly few appearances of Brunner’s work on Disneyland/Buena Vista Records, despite his large resume of films and TV show scores. One exception is the soundtrack score for That Darn Cat. When the dogs come into the house to howl, it’s actually the Mellomen performing “Home Sweet Home,” from the soundtrack of Lady and the Tramp. The other canine, “Joshua” was recorded at the home of Disneyland Records’ President Jimmy Johnson with the family dog. 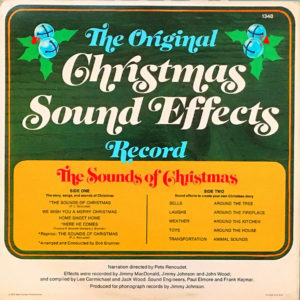 Side two of The Sounds of Christmas was entirely made up of sound effects like tinkling tinsel, airplanes arriving filled with relatives and toys. But unlike a Halloween album, which has scary functions for parties and trick-or-treat, how many ways can one use sound effects on Christmas? 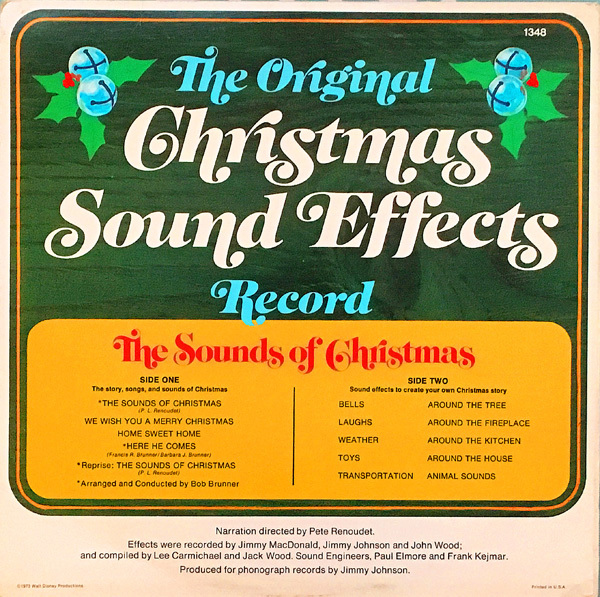 Pickwick Records produced a similar album called Fun and Sounds of Christmas. Veteran character and animation voice actor Peter Renaday–or “Renoudet” as he is also credited—appeared earlier this year on a premiere CD on the never-before-released symphonic version of the song “Love” from Robin Hood. He recorded this when there was discussion among the animation team of Robin Hood singing on camera. This alternate version of the Oscar-nominated “Love” is one of the bonus tracks on this year’s Walt Disney Records Legacy Collection release of Robin Hood. Looks like Santa’s having a Grinch moment on the SoC cover (“All the noise, noise, noise, noise!”). In due time, Greg. In due time. Possibly next decade.. This is the version of the Christmas Carol album that I had. I never knew it was revised until years later. It was an extreme disappointment at the time….NO character voices, and a bland narration that promises that “even though it gets scary, it all turns out all right in the end” thus removing ANY potential suspense. After a while I “got used” to it, although it was never a favorite listen of mine. 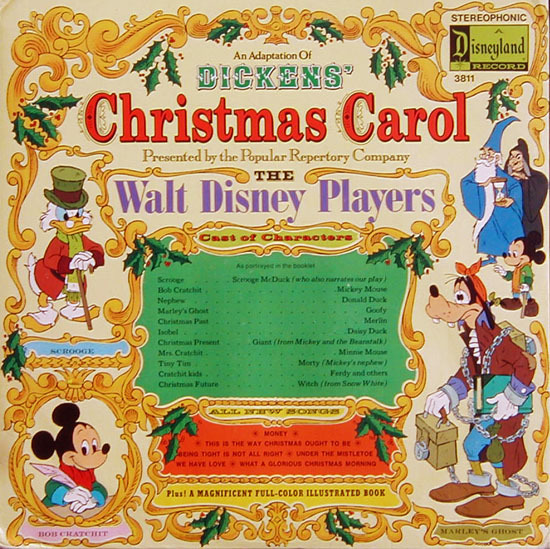 Some of the songs were OK–“Under the Mistletoe” stands out as one that could fit in any other Christmas context, as also is true of “What a Glorious Christmas Morning.” Bill Lee was definitely talented in the vocal department, but his in-character narration as Scrooge was underwhelming to say the least. The spring before the sound effects album came out I had written to Disneyland Records suggesting L. Frank Baum’s story “A Kidnapped Santa Claus” as a possible Christmas storyteller album, and they liked my suggestion so much that they sent me a free record (“Mickey Mouse: This is My Life” in case anyone’s wondering). 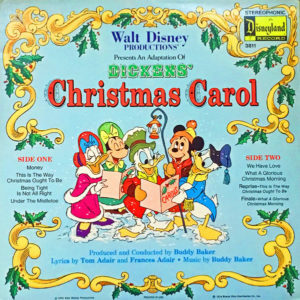 While my idea was not used, it is interesting that several Christmas albums were released or reissued by Disneyland Records the very next Christmas. I’m not saying my letter inspired this Yuletide wave, but there might have been a few hundred other children making similar requests for Christmas material–something that had not been readily available from Disneyland Records for a few years by the early 70’s. 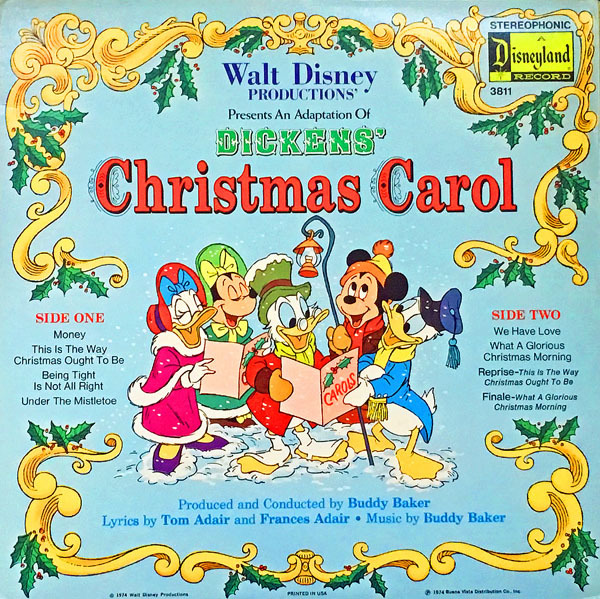 The first release of the “Christmas Carol” album has received very little mention though the years, overshadowed by the vastly superior remake that employs the iconic Disney characters, but this first attempt is at least a noteworthy beginning for the development of the concept. The booklet, at least, delivered what the album cover promised. Kind of weird is seeing the Sounds of Christmas reminded me of the annual broadcast by SoCal radio stations KGRB/KBOB also called Sounds of the Seasons which broadcast vintage Christmas music some of it very rare .from the 1930’s to the mid 1950’s which included Peggy Lee,Jo Stafford, The Little Dublin Singers and as a bonus the entire soundtrack of Alcoa Theater’s The Stingest Man in Town featuring The Four Preps. Sadly when KGRB/KBOB went off the air for good in the early to mid 1990’s so did the vintage Christmas music that aired on the Sounds of Christmas broadcast. There was also a Julie Andrews TV special called The Sounds of Christmas sponsored by Hallmark. They even released a CD. I too remember those stations as well!